Winter’s start officially begins on Dec. 21st this year. It’s hard to know what to expect as far as weather goes, but we can make a few assumptions here in the Midwest anyway. There will be times when it will be sunny and temperate, it could be overcast and bitterly cold, it could be dry or maybe raining, there could be ice, it can snow just a little or be a total whiteout. There could be no hint of air movement, or it’s so windy you can hardly stand. And unfortunately, here in Kansas, all of these things can sometimes occur within a 24 hour period! We can do little to change what Mother Nature throws at us, what we can do is try and be prepared for whatever does come our way this winter season. This requires some action on our part and isn’t really all that hard to accomplish as it just takes a little awareness and the appropriate action on our parts. Below are just a few tips in making sure that we can endure whatever weather that the upcoming winter might actually bring. Avoid slip and falls. Use appropriate footwear. Insulated boots with deep treads or ice traction devices are recommended. Keep your head up and walk cleared or marked paths if possible. Keep your hands out of your pockets to aid in balance if you should start to slip. Clean your shoes off before stepping unto tile or other smooth surfaced floors inside. If you work primarily inside and have to wear more fashionable shoes, change into those once you get safely inside. Just remember to change back before venturing out again. Dress in multiple loose fitting layers so you can meet the conditions you find yourself required work in. Few things are worse than being all warm and toasty while working outside in the cold and then moving indoors to immediately start sweating in the warmth. Being able to shed some outer layers, without exposing too much of ourselves, can be more than a question of modesty. Continuing to work inside while you are overheated will lead to hyperthermia. Staying dry while in the cold is a major concern and moving back outside with all that sweat in your clothing will cause a much faster loss of body heat and expose you to the risk of hypothermia or over-cooling. Protect any exposed skin, especially in windy conditions. It only takes a few minutes of exposure to suffer frostnip, or worse, frostbite. Using a ski mask or balaclava – not to be confused with baklava, a delicious Turkish desert! – to cover your head, face and ears can protect them from the wind and cold. Gloves can help protect your hands and fingers, but use caution as they can actually reduce circulation. Although not as fashionable, mittens can be better for your circulation and they allow the fingers to generate more heat which can benefit the rest of the body as well. Warm up before shoveling snow or beginning other strenuous outdoor work. Take a few moments to stretch your muscles first. March in place or walk back and forth for a few minutes. When you and your muscles are warmed up you’ll work not only more efficiently, but you’ll also reduce the risk of injuring yourself. During the work, take frequent breaks to warm up or to take a breather. Don’t overdo it on the coffee or cigarettes though. Caffeine and Nicotine are vasodilators and can create unnecessary strain on your heart when coupled with heavy exertion. Also, remember to always inhale through your nose and exhale through your mouth when outside in cold temperatures. Drawing air through the nasal passages provides a little pre-warming and slightly moisturizes the air prior to reaching the lungs. Exhaling through the mouth helps to prevent your nose from running as well. Warm up your vehicle prior to driving it. Letting your vehicle warm and begin removing the built-up moisture with-in will help keep the windshield clear. Just don’t run it while it is in the garage and don’t leave it unattended either. Remove all snow and ice from your vehicle’s windows and if possible, remove snow from the top of your car as well to prevent that from sliding down and covering your windows again or blowing off and covering someone else’s. Stock your vehicle with a few emergency supplies. Include a flashlight and extra batteries, tin can, candles, paper cup, matches, emergency blanket, shovel, some rock salt or kitty litter, as well as some snacks not subject to freezing. If you should become stranded and have to remain in your vehicle for an extended amount of time you can use the tin can and candles to melt snow for water to drink. The candles will also provide some warmth and light. 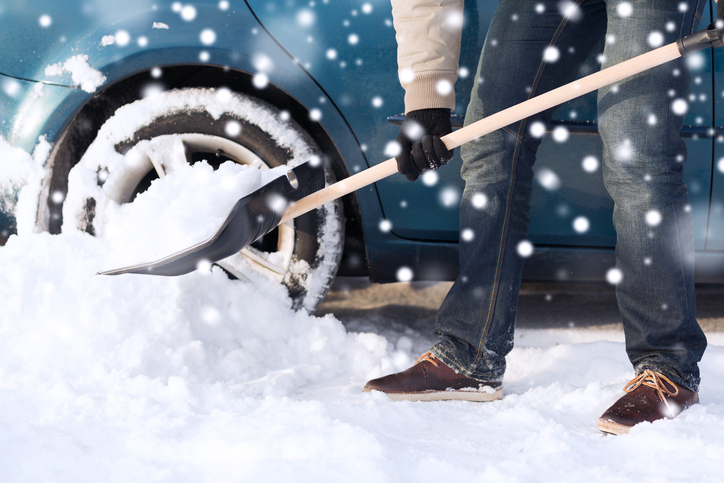 The shovel can be used to remove snow and the rock salt or kitty litter can be used to provide traction if your vehicle becomes stuck on ice. Keeping a cell phone and additional charger in your vehicle can also be useful. If your vehicle is still operational you can run it for 10-15 minutes every hour or so to keep the interior warmer, but be sure that the exhaust system is intact and the tail pipe is not blocked by snow or other debris before doing so. Winter weather can often bring stunning visual vistas and opportunities for outdoor activities like skiing and sledding. And who doesn’t like the possibility of a white Christmas? But for those of us just trying to get to work or charged with keeping sidewalks and entry’s safe to use, it can be whole lot less beautiful and fun. Whatever your particular opinions about winter and the types of weather it can bring, being prepared is our best chance of getting through it accident and injury free.